I first met Kiki a year ago preparing for a field trip for my American Sacred Space class. 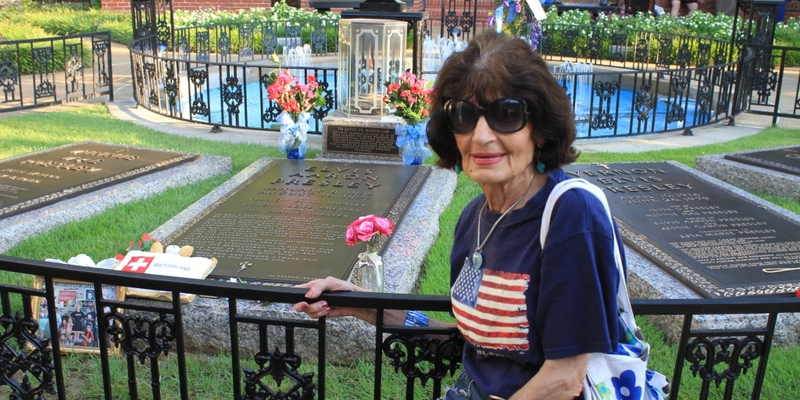 She may be Elvis Presley’s most devoted fan, showing up at Graceland early every Saturday morning to clean the Meditation Garden and refresh the flowers on his grave. Kiki told me that she moved to Memphis in 1985 from Greece to be closer to Elvis. She explained that for many years she came to Graceland every day to care for The King’s grave, but now she has a day job at a local restaurant and comes only on weekends. Every Saturday she boards a city bus with her armload of fresh cut flowers to make the long ride out to Graceland in time for the free walk-up time at 7am. She often chats with visitors and pilgrims paying their respects at the gravesite, and over the 30-plus years of her devotion, Kiki has met a number of relatives and close associates of her idol. But most of all she fulfills a dream she had as a young fan in Greece decades ago, to care for Elvis’s final resting place and keep fresh flowers on his grave.